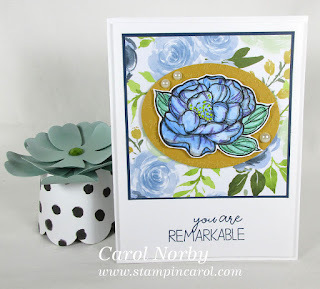 Yesterday was my first day to stamp in a week! But I have a wonderful excuse why I was away from my craft den last week... Our son, his wife, and our adorable grandson were here! They flew in Tuesday afternoon and left oh dark thirty Saturday morning. Saturday was a sad day but I do have oodles of pictures of our family so I can relive the memories. We went to the Pima Air and Space Museum and Old Tucson. We had great fun. But now, back to work. 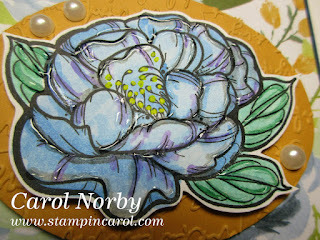 I decided this card will be another we'll make in my April 26 class. 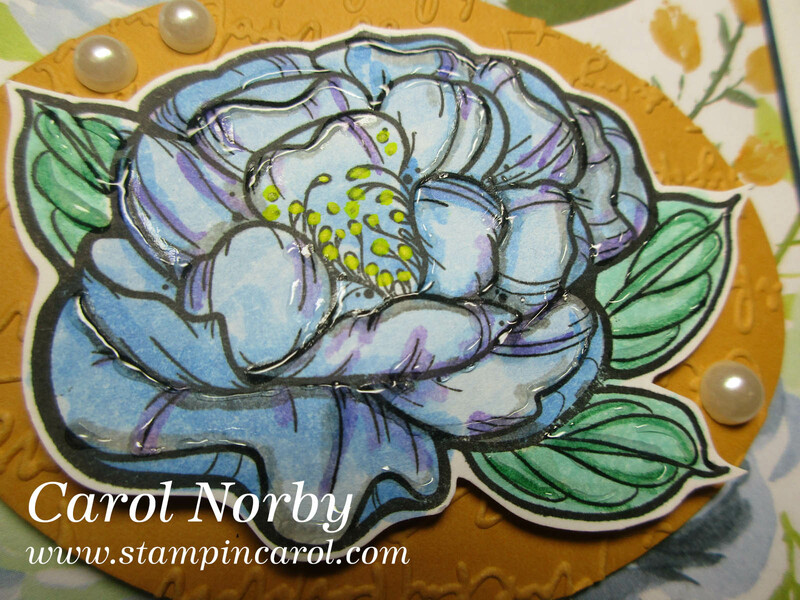 I used a cool Spellbinders stamp set by Stephanie Low called Large Peonies. I colored it to kinda match the background paper. I colored mostly using my Color Splash Pencils but then added some green to the leaves using the Color Burst Pencils. And yes, it's okay to use both a watercolor and a colored pencil on an image! LOL! You can barely see that I've added lines of Journey Glaze to the image. A few little specks of Sour Lemon Silk applied with my Blending Brush finished the flower. What do you think of my card? Do you like my coloring?